In lean, hypnotic prose, Hoffman (Indigo) constructs a post-apocalyptic fairy tale leavened with hope. 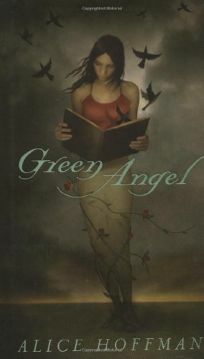 "I was a moody, dark weed," confides Green, a shy 15-year-old with a talent for gardening who narrates the novel. Angry at being left behind one day when her parents and younger sister go to the city to sell the family's produce, Green has "too much pride to say good-bye." She comes to regret her decision when a cataclysmic fire destroys the city—and her family. In an all-too-frighteningly familiar scene, Hoffman describes bystanders who "could see people jumping from the buildings, like silver birds, like bright diamonds." Green walls herself off from emotion. She renames herself Ash, crafts a sort of armor from her father's old leather jacket and nail-studded boots, sews thorns onto her clothes and tattoos her body. "Blood and ink. Darkness where before there had been patience, black where there'd once been green." But she begins to heal all the same: she leaves food for a desperate classmate for whom she had once felt only envy, and takes in a stray dog, a wounded hawk and a mysterious boy her age who keeps his face covered and does not speak. The author builds the narrative like a poem, meticulously choosing metaphors that reverberate throughout the novel. The "diamonds," the lives lost, become reborn in the person of the mute boy whom Green calls Diamond; sparrows knit Green a fishing net from her own hair, with which to catch supper when her food runs out. The birth of spring coincides with the rebuilding of the city—and Green's reawakening ("I could feel something green growing inside me. Green as summer in my bones").